These are pictures of the samples for the online demonstration along with instructions used to create stamped unglazed marble tiles. This is what the unglazed tile looks like. We purchased ours at Home Depot. For step one, you need to rinse the tile under running water to remove the "marble dust" that coats it. Alternatively, you can wipe it with a damp cloth or sponge. Let the tile dry completely. For the first set of 4 tiles, I used Brilliance ink: Black & Red. Be careful in choosing images - no stamps with solid areas because the image may "skip" and become unreadable on the tile. The image used on tile 1 is GI110F. The ink is Brilliance black. The image was firmly stamped on a cleaned unglazed, rosso verona tile. Drying of the ink was accelerated using a heat gun. The primary image used is GI104F. 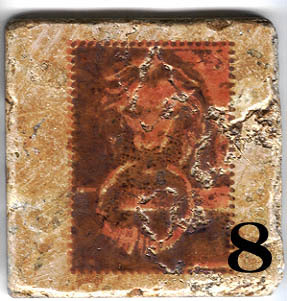 A text stamp from Sheet 27b was used to decorate the tile edges. The unglazed tile was stamped with Brilliance red, dried with a heat gun. Several coats of Krylon Clear sealer were sprayed on. For these 4 tiles, I used Fresco inks. In the next several photos, I explain the technique, and identify the stamps and colors of inks used. When overstamping on tile, be sure to let the first image dry completely. For this tile, I used the duotone images from Stamp Sheet 23b. First I stamped the text image from Sheet 27b onto the tile using Fresco Olive Grove. Next, stamp the positive image with Fresco Blue Grotto ink. 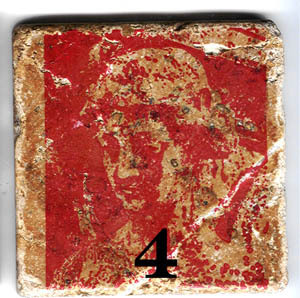 The unglazed tile was stamped with the text stamp from Sheet 27b with Brilliance red and allowed to dry thoroughly. Stamp GI107F was then overstamped with Brilliance black ink. This was also dried thoroughly using a heat gun. The tile was then sealed with several coats of Krylon Clear sealer spray. For this tile, I used the duotone angel stamps on Sheet 49b. First, the negative image was stamped on the unglazed tile using Fresco Tuscan Earth. This was allowed to dry thoroughly (using a heat gun to speed up the process). 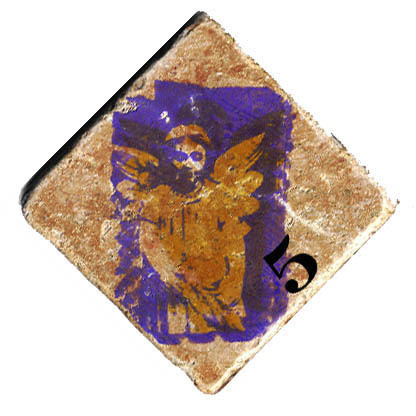 Next, the positive image was overstamped with Fresco DaVinci Violet (doesn't have to be exact). Seal with Krylon spray. The duotone lion images from Stamp Sheet 29b were used. I first stamped the negative image on the unglazed marble tile using Fresco Sicilian Spice. Overstamp with the postive image using Fresco Amaretto Truffle. The image used was GI105F. Stamped with Brilliance red on unglazed marble tile. The image was allowed to dry thoroughly before sealing with several coats of Krylon Crystal Clear Spray. This is also duotone stamping using a statuary image from Stamp Sheet 53b. First stamped the postive image (image on left above) onto unglazed marble tile using Fresco sistine sky. Next, it was overstamped with Fresco Indigo Velvet. Spray to seal. I first painted the tile using Peerless watercolors (I like to use those because the color is very concentrated and not washed out like other watercolors). Let this dry thoroughly. Next, I used the text stamp from Sheet 25b. Inked with Fresco Vatican Wine & Fresco Blue Grotto ink; used inks to stamp around the edges of tile in a cross-hatch fashion. Note, with the Fresco ink on the tile, the letters will not be crisp but it does add texture. Let this dry. I then overstamped using Fresco Amaretto Truffle. I then overstamped it with Brilliance Black.